Robot smashes Rubik’s cube record, solves puzzle in 0.38 seconds. A new machine, created by software engineer Jared Di Carlo and MIT Biomimetic Robotics Lab student Ben Katz, cracked the colorful code in just 0.38 seconds. The current world record time of 0.637 was set in 2016 by German semiconductor manufacturer Infineon and the Sub1 Reloaded bot. Total solve time—from the moment the keypress is registered to the last flip—includes image capture, color detection, computation, and the rotating of the cube’s faces. Actual motion time is about 0.335 seconds. “The machine can definitely go faster,” Katz wrote in a blog post. “But the tuning process is really time consuming.” Even the smallest mistakes can lead to broken cubes or fried hardware. 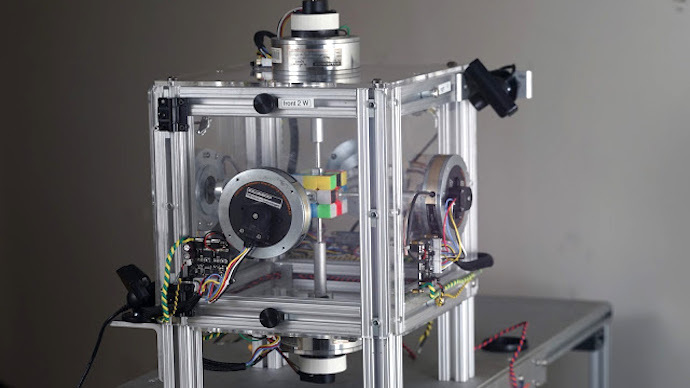 The contraption consists of ServoDisc motors and custom controllers, two PlayStation Eye cameras, and, of course, a Rubik’s Cube. The pair opted for cheap versions of the toy, assuming they’d wreck them in great numbers. In the end, they used only four cubes testing hundreds of solves, according to Di Carlo. Since its invention in 1974, the 3D puzzle has become the world’s best-selling game, helping to promote mathematical thinking and problem solving. The object is to restore all six sides to their original position without going crazy. Katz and Di Carlo’s robot has not yet been reviewed by Guinness World Record officials. And while the young engineers don’t seem very interested in 15 additional minutes of fame, it would be nice to properly document the achievement for future tinkerers to beat.